Moist. Streambanks, thickets, wood edges, roadsides. This is an annual, herbaceous vine produces multiple lanky, prostrate or climbing stems from a shallow, branched taproot. It has separate male and female flowers, both appearing on the same plant. The stems are light green and hairy. They can extend 18′ to 25′. 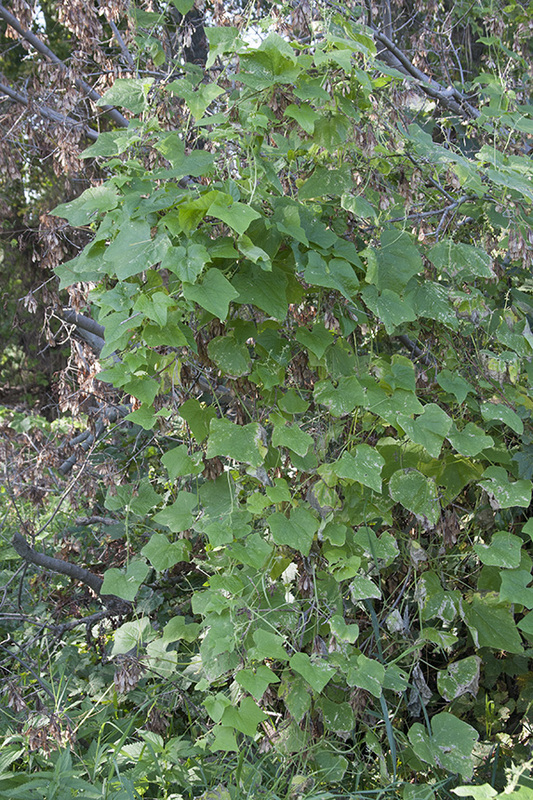 The leaves are alternate and are attached to the vine on 1″ to 3″ long leaf stalks. They are up to 8″ long and 8″ wide. 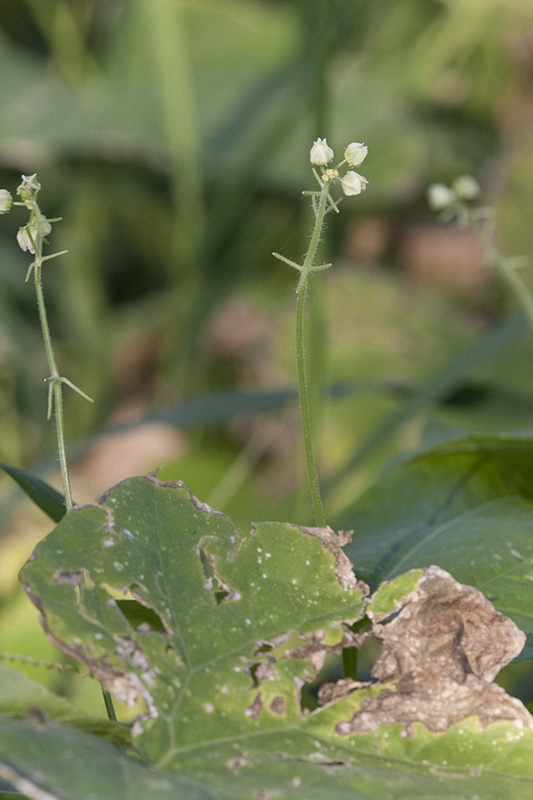 They have 3 to 5 shallow lobes with pointed tips, and are deeply-cleft at the base where they attach to the leaf stalk. The margins have tiny, widely-spaced teeth. The leaf surfaces are rough to the touch. The upper surface si mostly hairless, the lower surface is covered with fine, short hairs. The male and female flowers are borne separately from the same leaf axils. The male inflorescence is a 12″ to 16″ long, erect cluster of many flowers. The female inflorescence is a small, head-like cluster on a shorter stalk. The flowers are ⅓″ to ½″ wide and star-shaped. They have 5 petals that are pale green with darker green veins. There is no fragrance. The fruits are in clusters of 3 to 5. Each fruit is a ⅓″ to ½″ long, egg-shaped capsule covered with spiny prickles and long white hairs. It contains 1 seed. 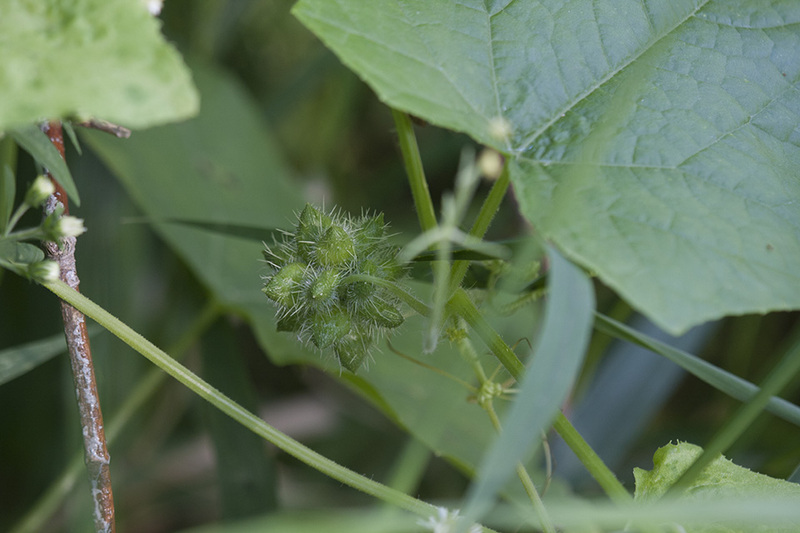 Wild cucumber (Echinocystis lobata) has hairless stems. The leaves are more deeply-lobed. The flowers have 6 petals. 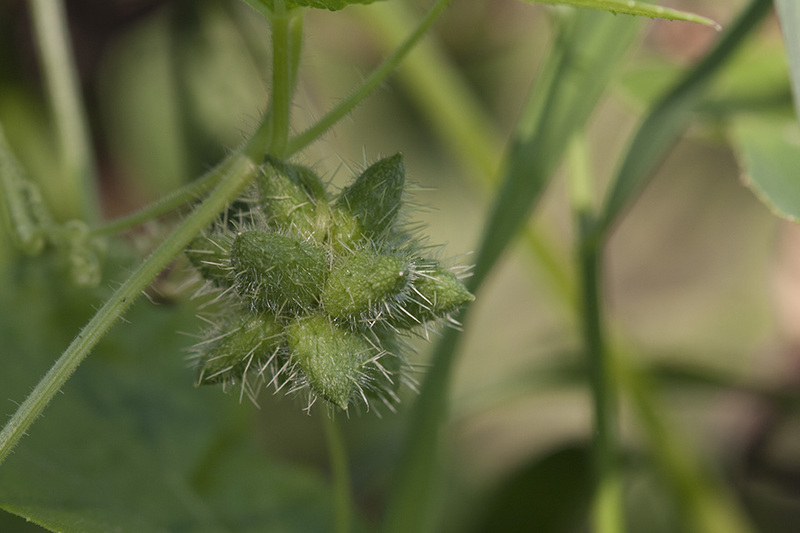 The fruit is a much larger, green, inflated, egg-shaped capsule containing 4 seeds. 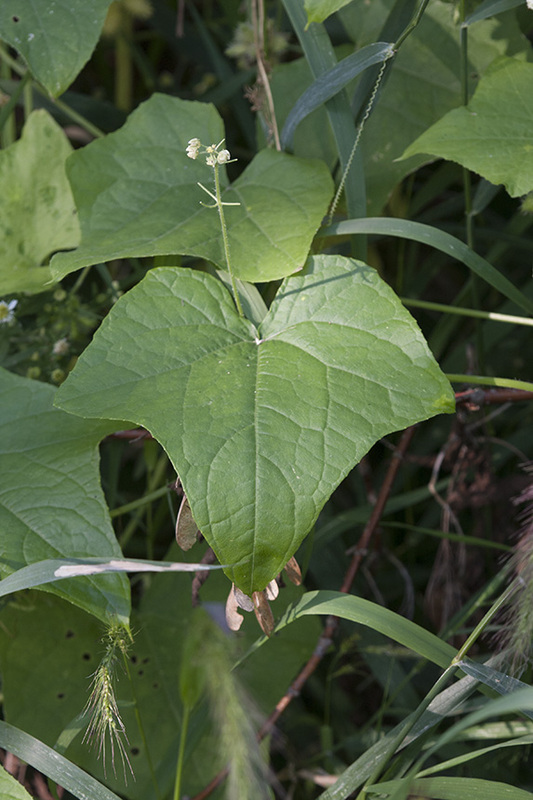 Canada moonseed (Menispermum canadense) leaf stalks attach to the blades a little less than ½″ inside the margin. 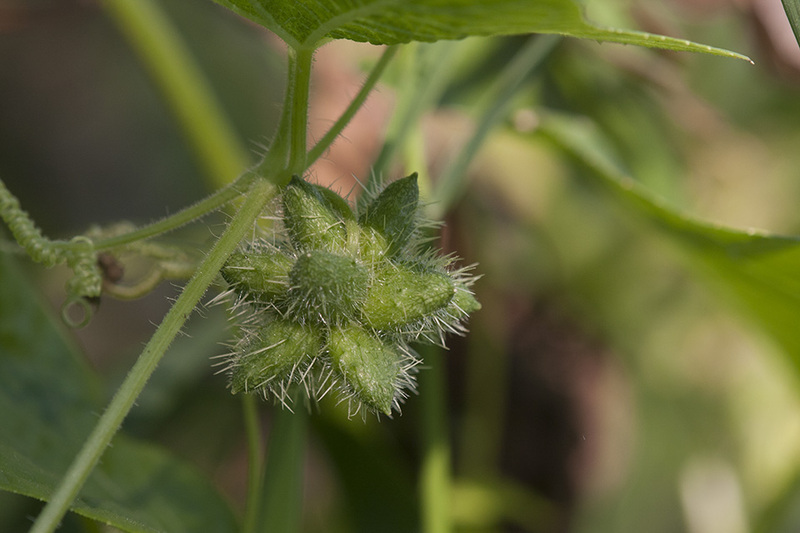 It's our Weed of the Week, Bur Cucumber.